Who doesn’t love a beautiful, nicely placed gallery wall? You know what I mean…they’re all the rage right now. Various pictures on the wall together that make the wall really pop. Gallery walls have been a favorite decor element of mine for a long time. 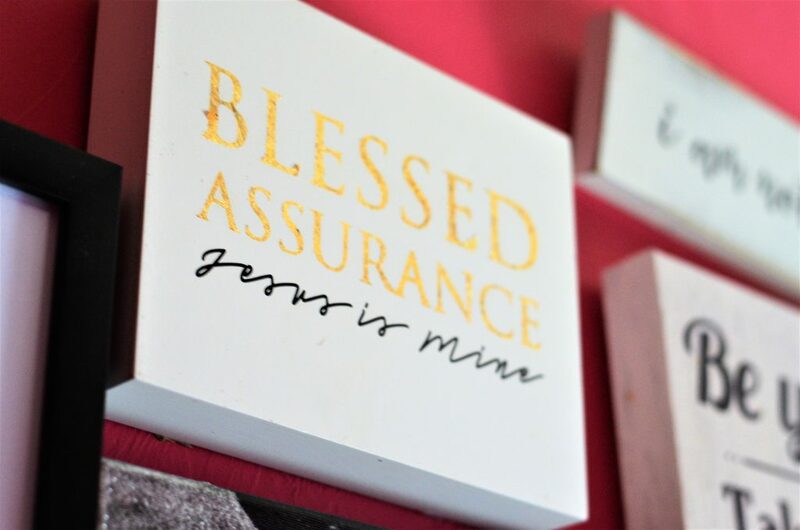 I currently have one in my room above my desk that I am in love with! I’ve got a news flash, mine is a lazy girls gallery wall! I’m not OCD about stuff like this at all, so be warned this is for those of us who don’t care if something is an inch off or something. Some people lay out the items for the gallery wall on the ground before they put it up. Most measure and mark spaces so that it looks symmetrical and unified…then there’s me. My gallery wall has grown little by little over a year and It’s to the point where I am fully happy with it and how it looks. I’m going to let you in on a little secret…I haven’t measured once. And I haven’t “pre-decided” on how the pieces were going to fit. I honestly just started off with a few items and threw them on my wall. Eventually, it became the gallery wall I have today. I know I can’t be the only one out there that doesn’t want to take the time to perfectly plan or measure out the gallery wall before you put it up. That also means you have to have all the items before putting it up. Not in my world! 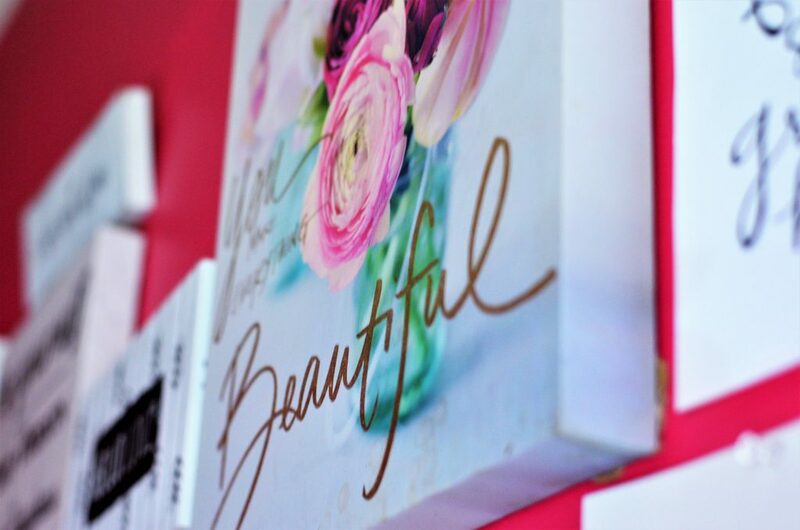 Today I wanted to share a few quick tips on creating a lazy girls gallery wall. No fuss with all the style. Now I understand that not everyone can stand back and begin placing items like I did, but the point of this is to have fun with the gallery wall! Now I don’t mean you necessarily have to tape out each frame size and lay it out on the floor because this is a lazy girls gallery wall. But I do recommend looking on Pinterest and coming up with the overall look you’re wanting. Do you want a big one? A small one? Do you want it tight and compact or more spaced out? When I started mine I only had the long canvas and the painted cross one and I just started building as I bought pieces. I do think you need to have a little bit of a plan in mind. I knew I wanted a varying gallery wall and I kept going until I reached what I wanted. One of the biggest tips I can give you is to vary the sizes of the items you pick. Even if you’re only using frames- get different sizes! I have tiny items up to long and bigger canvas’. All of which is makes for a better-looking gallery wall. I’m no interior designer but I personally prefer a variety in my gallery walls. 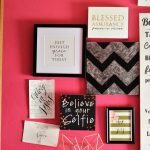 The idea of a gallery wall is to have all these pieces eventually fit cohesively on your wall so the best way to achieve that is to use multiple sizes. This is the step you might have to do a little visualizing. I didn’t measure or pre-plan anything. I stood back and envisioned how it would look. Most of my pieces were very light so I actually mainly used push pins because that allowed me the ease of changing spots if I had too. One look at my wall color and you will know that I love the color. We’re currently looking to move and it’s funny because I prefer the houses that are very gray, white, and wood but that’s just because my pops of color will go perfectly with those tones. Color is the spice of life, right? In my personal gallery wall, I have a lot of black and white but I have pops of gold, pink glitter, pinks, and purples. Obviously, with my bright wall color, I don’t use as much color as I would if it was a white wall. I love when gallery walls include some pops of color because it draws the eye through the gallery wall. This tip is more of a personal choice, so feel free to go neutral if you would want. 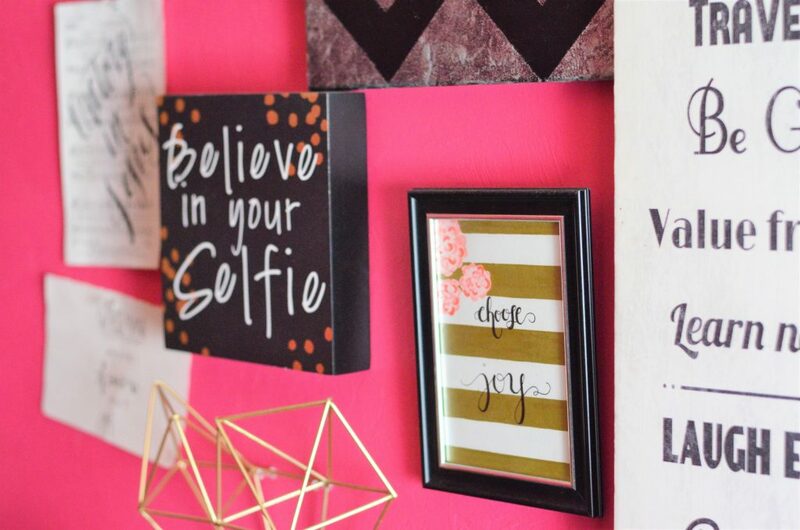 The thing to remember is this is your gallery wall and bottom line: there are no rules and no one telling you how to do your own wall. 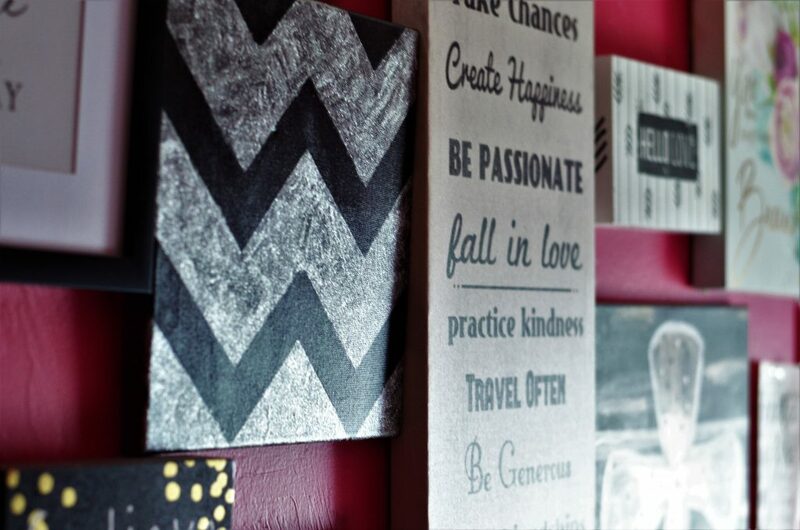 I prefer a mixed medium gallery wall; meaning, I have canvases, frames, paper, wood, and even one 3D heart to add more texture. Once again, this is mainly a preference tip. There are some good gallery walls full of just frames- but my favorite are the ones full of variety! 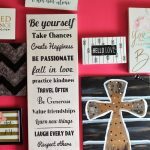 I also love being able to just be out shopping and finding an item I want to add to my wall with no restrictions on what it has to be. 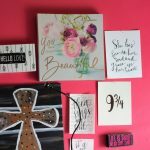 Not only do I have a variety of mediums but I also have a mix of printed and handwritten as well. I have a few pieces from some lovely friends and Etsy shops that are hand-lettered that add a really nice personal touch. The main idea of a lazy girls gallery wall is to not have to do all the planning and measuring. The way you do that is you have to be willing to switch things around if you don’t like the look. A few months ago I had to rearrange some items because I was adding a few items and it was off balanced. I had too many bigger items on one side and it looks wonky so I just rearranged! If you’re going to put together a lazy girls gallery wall you can’t be afraid to switch things around at one point if needed. To each his own, but I’d rather move one or two things around than bother with measuring and planning out the exact look. If I did that, I wouldn’t have been able to put it up until a month or so ago when I finally bought everything I felt like I wanted in the gallery wall.